Crimean Tatar Flag Day is an annual observance celebrated by Crimean Tatars (mostly those residing in Ukraine) on June 26. It celebrates the ethnic flag of Crimean Tatars that symbolizes their unity as a people. 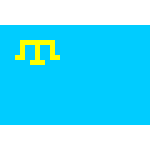 The Crimean Tatar flag is a light blue banner with a yellow (golden) emblem in the top left corner. The color blue is traditionally associated with the Turkic peoples, whereas the emblem is a tamga, an abstract seal used by Eurasian nomadic peoples. This particular tamga used to be the official symbol of the House of Giray, the dynasty that ruled the Khanate of Crimea from the early 15th century until its annexation by the Russian Empire in 1783. Crimean Tatars have adopted the Giray tamga as their national symbol. The Crimean Tatar flag was first adopted by the national assembly of Crimean Tatars (Kurultai) in 1917, shortly after the February Revolution in the Russian Empire. The second Kurultai was assembled on June 26, 1991, two years after Crimean Tatars began to come back to Crimea from deportation. On June 30, Kurultai officially reinstated the Crimean Tatar flag as the ethnic flag of Crimean Tatars. In 2010, Crimean Tatars began to celebrate June 26 (the day the second Kurultai began its work) as Crimean Tatar Flag Day. Following the annexation of Crimea by Russia in 2014, it is mostly celebrated in Kyiv and other cites with a significant Crimean Tatar population in mainland Ukraine. Celebrations are held under the motto “Two flags, one country” (referring to the fact that the national flag of Ukraine is also blue and yellow).